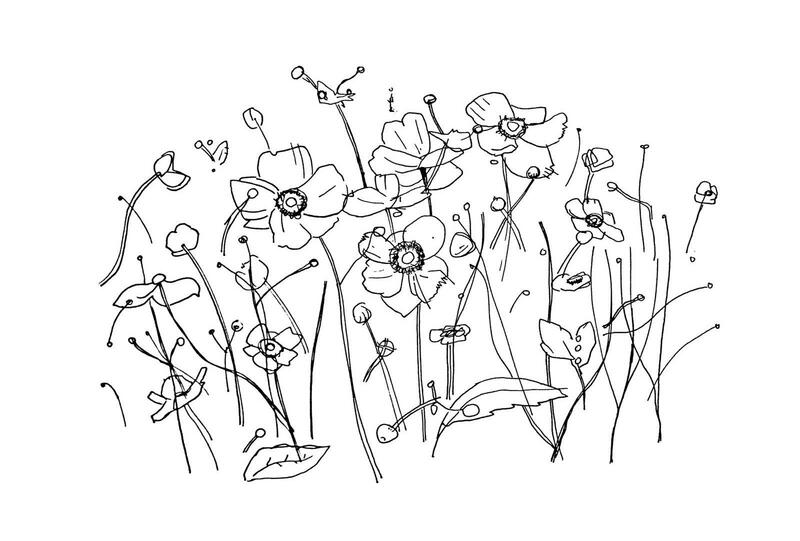 Japanese anemone—Anemone x hybrida ‘Honorine Jobert’ drawn by Klaussie. The first issue explored the roots of my interest in gardening, as well as time, patience, and grief. This second one was about how I’m dealing with my platonic life partner moving city (spoiler: badly and through gardening). I should mention now that I don’t like change. I acknowledge that this is a very stupid thing for a gardener-in-training not to like because gardens are all about change. Every Tuesday I go to Plant School (its official name) walk beneath the arch of the pergola wearing its showy coat of wisteria and I am struck by what is gone and what has come up in the gone thing’s place. One week the Crayola yellow flower of the Jerusalem artichoke—Helianthus tuberosus—is reaching towards the sun and the next it has tipped, sot-like, over into the bed I weeded just last week. The weeds, of course, are back. They are always back. The quince has had its fleece removed, been mixed with fennel, cumin, fenugreek and mustard seeds, and turned into aachar by the former garden manager. I eat it, wincing, straight from the spoon before I’ve had anything else to eat at all. Last time I was here the white petals of Japanese anemone—Anemone x hybrida ‘Honorine Jobert’—were prolific as polka dots but now only a few remain amongst the bobbing, tonsured heads of their friends. A small number of blue flowers from the leadwort—Ceratostigma plumbaginoides—are hanging on too but the petals’ edges are withering like spinach left too long at the bottom of the bag. I first met Nell in the old Jazz Cafe at Foyle’s in 2014. I was reserved, cautious, untrusting, and nervous. But I was also newly out and had just started university; I was learning so many new things about the different ways one might understand the world and I desperately wanted to share them with someone. Nell made it so easy. She is the best question asker I know: she is unendingly curious, challenging, and extraordinarily smart. She has taught me so much about who and how I want to be in the world. With and from Nell, I have learnt how to be curious, intentional, conscientious, and careful in friendship as in life. I learnt (slowly) to turn towards her and, in turn, towards others. It is difficult to know how to look a move of this kind in the eye. This Tinyletter is about how I am trying to contend with The Move. You can subscribe here.